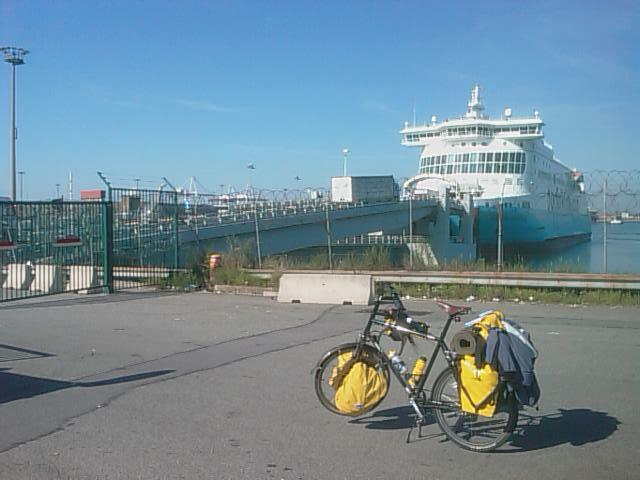 As I cross the Channel from Dunkirk to Dover on my conclusive way home, this probably will be my last substantive blog post (though I might be tempted to indulge once more on climate change) . Pic of Raven to illustrate, with rather bleak Dunkirk terminal and appropriately-named Norfolk Lines ferry (Norfolk being my home county in the UK) in the barbed-wired background. So what have these 4000 miles (well, will be 4000 by the time I reach London tomorrow) really been about? There are things one reveals in a blog. And there are things one doesn't. But let's say with TS Eliot (Prufrock?) that a pilgrimage is often about setting out on a journey of personal meaning and finding that the search takes you right back to where you began. Perhaps retrieving one's soul on a journey like this is a bit like the trauma therapy to whose practice I now return. To lay to rest the ghosts, the unreal hopes of the past, the pain, the incomplete Gestalts (see much earlier blog posting….) you have to revisit and reexperience them, so you can, with luck and perhaps a touch more wisdom, move on. Moving on of course having been the core theme of my journey with Raven – settling in over the months to a comfortable average, when on the road, of about 70-80 miles a day, or 100-120 km. Mostly camping, with the odd youth hostel, plus welcome stays at friends homes, thrown in. It has been seriously fun, a very old dream realised. I head for home in Cirencester, arriving Sunday afternoon after a stopover in London, feeling quite a bit fitter, in many different ways, than when I set out all those cold and sunny and rainy and wind-blown weeks ago. To say that the world in its thousands and millions has awaited eagerly each new blog posting would be a mild exaggeration. But I know there are some of you out there who have enjoyed reading this. And for all the profusion of professional words generated and edited over a long journalistic career, I've probably – no, definitely – enjoyed maintaining this blog and communicating with you in this way more than with anything I've ever written. No editors to tell me to rewrite and refile. No concerns about implications in what I say for Reuters or BBC. And a closer sense of connection with you than even radio. Which considering my passion for that medium is saying something. Doing the daily blog has given structure to my travels, and narrative-building context – a dialogue as I spin along mainly with myself, but given that's who I did the trip for, I guess that's OK. So, a continent discovered and rediscovered, and wonderful friends, new but especially old, along the way, to whom my warmest and deepest thanks. You know who you are, and some of you also know just how important you've been. Thanks of course (sounds like the Oscars…) also to Raven, my most trusty steed and companion, and the perfect therapist who never interrupts my flow of thought or feeling with a badly-timed or inapprropriate intervention. She does need a new chainwheel, chain and sprocket, and a thoroughly good clean. (The attempt to change chains in Antwerp failed because the Rohloff sprocket was already too worn.) And I have finally replaced the rear brake blocks, although not yet the front. As the sum total of maintenance needed, that's not bad for 4000 miles. So thanks also to Robin Thorn and his team at St John St Cycles in Bridgwater for designing and building the world's best trekking bike. For all the half-way scare about an inflamed Achlles tendon, my 58-year-old physical system, including especially knees (the right one of which had keyhole meniscus surgery only last Christmas) has also held up pretty well. And a final special thanks to someone who hasn't actually been reading the blog, busy as she is with her many other enthusiasms, namely my wife Sue. She had the vision to encourage and support me in undertaking this venture, even though it wasn't always easy for her either. As the saying goes, framed on our bedroom wall: A relationship that deals with truth walks always the fine line between chaos and cosmos. So, in anticipation of a bit/even more of the latter, homeward. Hi Mark. Just wanted to say that I loved this blog, especially the bits about Belgium. I have almost turned around and left Brussels when searching for an address in the fog one Sunday evening – locals corrected my French rather than pointing out that road works had closed the road I was trying to reach. Hope you’re going to write a book or make a programme for Radio 4.